Existing Internet coverage of regional Australia has issues. Interim NBN Satellite is already at capacity. No new connections. Current download limits are very small. This limits applications available. Internet allocation can be used up in a few days of a month. No Internet for the rest of month. Australia's regional economy is held back by poor Internet connectivity. NBN will have 2 satellites launched. The first launch was successful on 1 Oct 2015. NBN Satellite is now live at April 2016. There are over 100 zones covering all of Australia from each satellite. This allows for more connections. The new faster satellite speed will be 25 Mbps download and 5 Mbps upload. This is over double existing satellite services. Download limits will increase to be similar to city Internet users. E.g. 1 GB download limit up to 10's GB download limit. Internet will be available from anywhere across Australia. More regional opportunities plus remote control and monitoring options. Internet access will help workers migrate to regional and remote areas of Australia. Economic development can improve for these areas. Tourists and Grey Nomads can gain Internet access. Social media updates promoting local areas can be made. VOIP telephony call can be made (1/2 second latency). Charge up devices while you are onsite. Stay longer in regional centres. Allow for smartphone/tablet notification updates even without 3G / 4G coverage. Download smartphone podcast (digital audio series files) updates for next leg for traveller. eBook / Library eBook / digital newspaper / digital magazine access. Keep up to date and learn faster. Download new emails. Send emails while onsite. Remote tutoring / education / distant education. E.g. Online TAFE, online University, massive open online course (MOOC). Teleworking. Access remote companies and provide digital services. E.g. Elance, Airtasker, Freelancer. eCommerce. Sell physical and digital products worldwide. E.g. Fulfillment by Amazon (remote warehouse and sales), iStockphoto (digital media sales). Access remote cloud computing resources such as online backup, online accounting and cloud business applications. Remote health consultations. This could include wearable health device data reviews. Share high resolution images with specialists. Internet of Things. River levels, water tank levels, groundwater levels, climate monitoring, soil moisture content, rainfall, wind speed. Extend Internet access coverage with WiFi point to point wireless links. The satellite dish requires 2 coaxial cables for receiving and transmitting. The satellite receiver has a 12 volt 20 watt maximum power supply. A Ethernet cable (category 5) connects the satellite receiver with your Wifi Router WAN socket. A basic Wifi Router can use a 12 volts 6 watts maximum power supply. The calculations are based on a Northern Australia satellite connection with 3 days of power storage. Solar panel is 200 watts or more. Deep cycle batteries are 2 x 6 volt 180 Ah in series. This was chosen for weight reasons. 32 kilograms each. 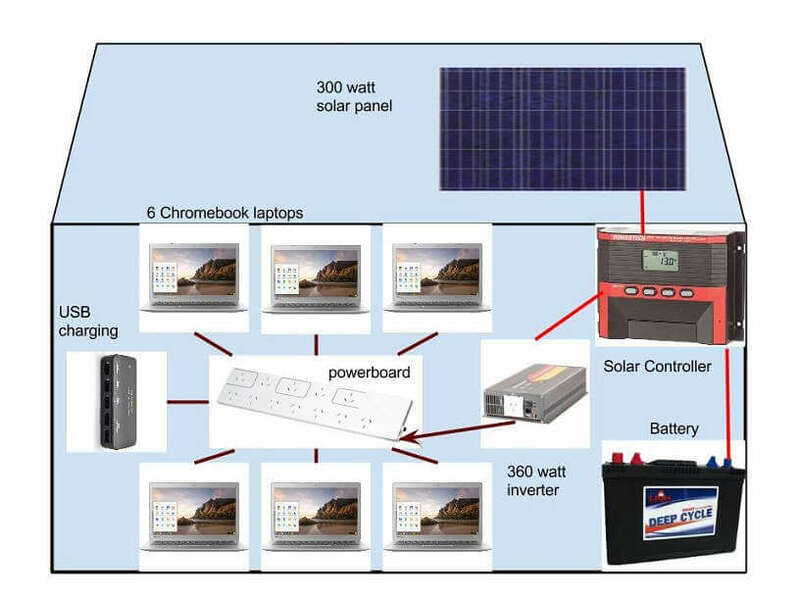 The solar controller is 30 Amps with Maximum power point tracking (MPPT). This controls solar input, battery charging and power to load. USB charging from a 12 volt source could keep tablets, smartphones and other devices charged in remote areas. 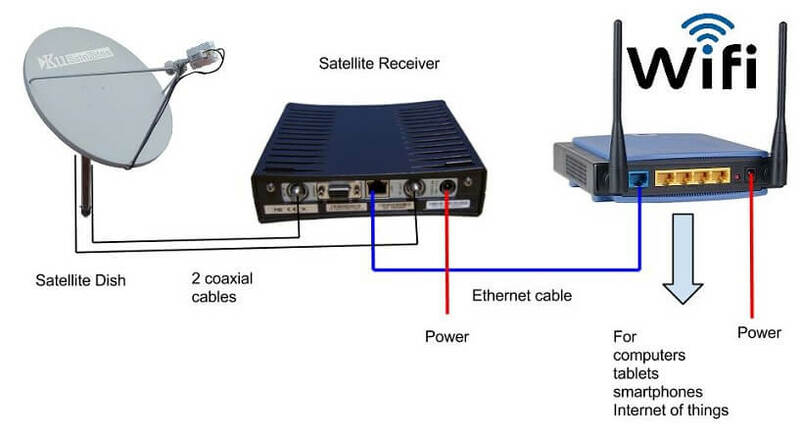 The satellite receiver and Wifi router should be kept below 40 degrees by careful design. 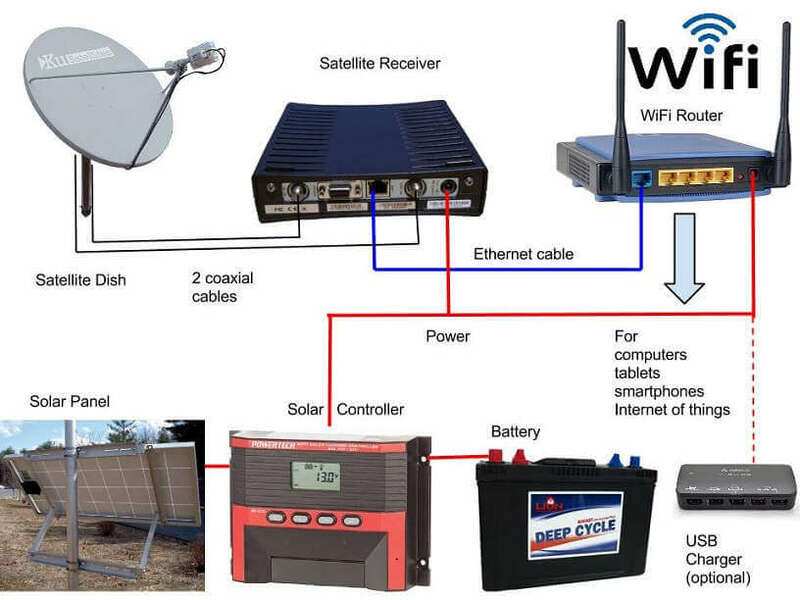 The goal is maintenance free low powered computing with satellite Internet in a remote setting. The solar panel is 300 watts. The deep cycle battery is 12 volt 108 Ah. The mains inverter is 360 watts. The 6 Chromebooks (laptop) selected were Toshiba with a 13 inch screen. 45 watt power supply. 10 hour battery life. 13 watts power use when fully charged. No fans design. Mains USB charging could keep tablets, smartphones and other devices charged in remote areas. Use the Internet connected Chromebooks with either Guest (no password login) or use your free Gmail/Google Docs/Google Drive login. Education classes could be run in the morning and afternoon. This can maximize usage of the computing resources and allow more students. The computing centre could also have 12 volt LED lighting and 12 volt fans. Bring Your Own (BYO) smartphones, tablets and laptops. Extend the usefullness of the computer centre. Some activities can be completed offline and then synchronised when online. E.g. Create documents/art/music/illustrations/photos offline and share/sell when online.